Of course, the large sensor and all the impressive tech surrounding it would mean little if the image quality isn't right. Rest assured though, Nokia has enough experience not to mess this up and the image quality of the Lumia 1020 is every bit as impressive as it was expected to be. We'll start off with full resolution 38MP photos first as they are the basis of the 5MP shots. As expected, the images look stunning - there's a slight grain to them but the amount of fine detail is amazing. You really get all the detail that usually falls between the pixels on lower-resolution cameras. Images don't look overly processed - Nokia tuned up the saturation so photos have punchier colors (it's what most people prefer) and the phone uses a light touch when sharpening the images (unlike recent 13MP shooters we've seen). We don't mind the saturated colors that much, but we wish the app had a saturation setting so we can tweak things to our liking. We were also quite impressed by the dynamic range - as we said, there's no easy HDR mode but the Lumia 1020 handles bright highlights and dark shadows in the same shot noticeably better than other smartphone cameras we've tested. Also, check out the macro shot - we couldn't get extremely close to our toy subject (again, the minimum focus distance is 15cm), but the shallow depth of field is very noticeable. It works great to separate the subject from the background and is something that requires a large sensor (digital trickery isn't anywhere nearly as nice). Let's move on to the 5MP shots. These photos are usually a tenth in the size compared to full resolution shots in terms of MB and these are the ones you'll be sharing on Facebook or via email. They are also the best 5MP photos we've seen come out of a phone. The noise levels become very low and every pixel of the image contributes to the fine detail. One of the unique features of the Lumia 1020 is use the digital lossless zoom, so we tried that too. The samples below show a 5MP image with no zoom, a 5MP image at 3x zoom and a full resolution shot. You lose the advantage of supersampling, but the image still looks great. And here's a representation of what a difference 3x zoom makes. We darkened a room in our office and tried the Lumia 1020's low-light performance. First, we tried with the flash off, we just kept the AF assist light on to make sure the phone gets the right focus. The noise levels went up (as can be expected) but it's just luminance noise and there's a good deal of fine detail that would be lost on other cameras. One again, the 5MP image reduces the noise and is actually very usable. Then we turned on the flash and snapped the photos again. The xenon flash is much more powerful than LED flashes and it lit the scene quite evenly. The image quality shot up - not to daylight levels, but the photo packs plenty of detail, even the full resolution shot. We tried something else too - we made the room even darker and put the Lumia 1020 on a tripod (we're starting to wish Nokia bundled the battery grip with the phone). Then using the manual settings we set the exposure time to the maximum 4 seconds. The first photo below is on full auto, except the flash was disabled, and is pretty dark and noisy. The next shot, the long exposure one, is much brighter, with relatively little noise and a surprising amount of fine detail. It's telling that the ISO went from 2,500 to just 160. One last thing we tried out was the panorama. It's the standard Nokia panorama we've used on other phones and while we were hoping for extra-high resolution, we only got around 13MP. The stitching quality is good, but the camera lost its place a few times (you have to pan back to resume) and it still has the problem of gradually guiding you up rather than keeping the phone level. The Nokia Lumia 1020 is a very good introduction to advanced photography - it has a full auto mode for the times you just want a photo and you can gradually start exploring the manual settings to see what kind of an effect they have. There are also fun lenses you can try - Smart Camera has some interesting options, there's Cinemagraph and the others. The Nokia Lumia 1020 shoots 38MP stills and there's only one phone in our database that manages that, the Nokia 808 PureView. The Sony Xperia Z1 is the only non-Nokia that comes close at 20.7MP. You might want to use the tool's downscaling feature to compare the 1020 against other phones more easily. The Lumia 1020 saves both a full resolution image and a supersampled one at 5MP. 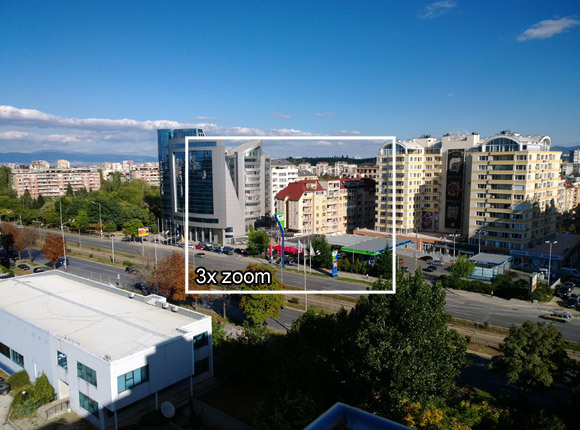 Here's how that looks compared to Xperia Z1's Superior Auto mode (which produces 8MP shots) and the HTC One (which goes for large pixels instead of many pixels). Video recording also greatly benefits from the OIS and oversampling. Zoom is enabled even during video capture and it can go up to 4x in 1080p mode and 6x in 720p resolution. The 1080p videos are recorded at 30fps by default, but you can also get a more cinematic feel with the 24fps and 25fps options. These are available for 720p resolution (but there's no 60fps mode). The Nokia Lumia 1020 also has two mics (one on top, one on bottom) with the company's proprietary Rich Audio Recording for distortion-free sound recording in loud environments. And unlike the Lumia 925, the Lumia 1020 records video files with stereo audio at a high 256Kbps bitrate and standard 48kHz sampling rate. There's also Audio Bass Filter, which filters out low-frequency noise. It can be set to 100Hz (the default), 200Hz (strong) and Off. The Lumia 1020 features Optical Image Stabilization (OIS), which highly improves the look of a video - it dampens hand shake and makes camera movement look smooth and professional (as opposed to shaky home footage). We recorded a short sample to show how the 1020 handles walking and panning. You can "see" footsteps in the video but the shaking from them is mostly not annoying. The slow pan looks almost Hollywood like, while the faster pan is jerkier. OIS has become available on some Android phones too, but most of them can't do this - 4x lossless zoom. It's controlled with a pinch gesture or the one-finger Slide Zoom that was introduced on the Nokia 808 PureView (unfortunately, the volume rocker doesn't work). You can do it during video recording. With no supersampling, the image quality drops a bit, but it's still a top notch video. Just like the still images, the videos produced by the Lumia 1020 are beyond the capabilities of any other smartphone on the market. The detail levels are excellent, the colors are extremely pleasing and the dynamic range simply cannot be matched by the competing phones, which all have smaller sensors. The 4x zoom when recording 1080p video is a more than welcome bonus, too. 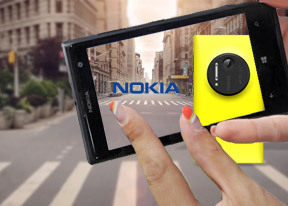 Comparing the video from the Nokia Lumia 1020 is easier as it shoots standard 1080p video. Here's how it stacks up against the Lumia 925 (mostly the same phone, save for the sensor) and the LG G2 (an Android phone with OIS).